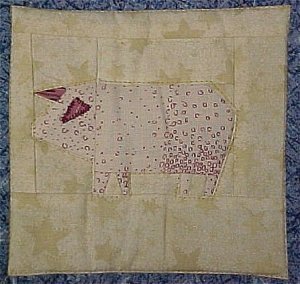 Since then, my consciousness has been raised about all things piggy, and in his honor, I have made him a piggy quilted thing. 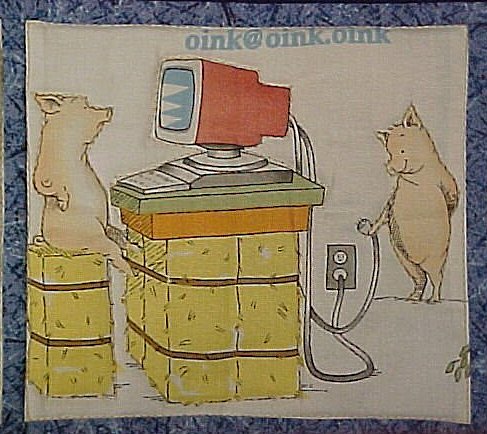 Since I know he has piggy paraphenalia at his computer at work, my original intent was to make a sorta "placemat" to put his piggy stuff on. To that end, I found this great piece of material of all sorts of animals at the computer. One of the animals was .. you guess it .. a pig .. on a computer: oink@oink.oink. (This is actually the center panel of the quilted item). Now, my 'MO' for gifts is to go for the "WOW!" effect (that's a congential defect amongst pirates, I'm afraid) and to that end, I couldn't *just* do a quilt square with that printed motif. So.... I found 2 different paper-pieced pigs and put one pig on each side of the pigs-on-computers. Then I had to put a border around it to set if off. But that looked sorta skimpy, so I put another border around that. 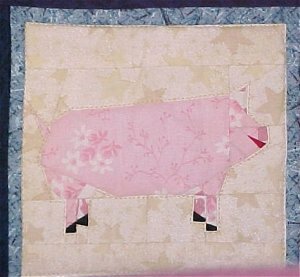 And the fabric I found for the backing was terrific .. all these lovely little pigs in space .. and I decided that putting some of the backing material as a third border was in order. I had previously decided to bind the quilted thing with the backing wrapped to the front. Yes, I know this isn't a particularly durable way to bind, but this isn't going to be a heavily used item. Well, with the pigs-in-space fabric as the third border *and* the wrapped binding, I needed something in between to set them off .. so I inserted a narrow accent strip. All of a sudden, my quilted placemat idea sorta became a small wall-hanging thing, around 22"x8". [embarassed smile] Just in case he should want to hang/display it at work, I even put on a hanging sleeve made from the backing material. I know that he is the sort of person who will appreciate this effort because we have had many discussions about quilts and how he, even now, laments the loss of the quilt during a move that a one-time g/f had made for him.